Classic Liquid Motion Lava Lamp 14.5”. The lamp consists of a bolus of a special coloured wax mixture inside a glass vessel, the remainder of which contains clear or translucent liquid; the vessel is then placed on a box containing an incandescent light bulb whose heat causes temporary reductions in the density and viscosity of the wax. Has all it original parts. Paper part (top of yellow cellophane insert) that allows the yellow color to spin needs fixed. Light works. No cracks in glass outside shade. Base and top are cast iron. Handsome antique turned wood bridge floor lamp. The lamp is black and gold with ornate highlights. It has a frosted reverse painted shade and brass hardware. The antique bridge lamp has been well kept and only shows some minor chips to the finish. The wiring is newer wiring and the vintage socket is working fine. The bridge light measures 56 inches tall. This lamp is from the 1920's and quite charming. Thanks for looking!. 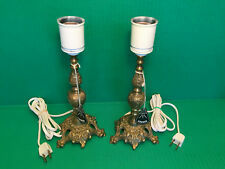 2 VINTAGE Danish CAST BRASS BRONZE Table Lamps Original Tags Unused DENMARK 10"
MADE IN DENMARK. ORNATE CLASSICAL DESIGN. SHADES, LIGHT BULBS AND SOUP CAN NOT INCLUDED. Antique lamped vase. The applied decoration is coming off and seems fairly easy to remove to leave a clean surface. All my lighting is old and will most likely need to be rewired. I usually cut the bad cords before taking photos but even if a cord is shown or fixture is lit up, all lighting fixture should be checked for safety before being plugged in or hooked up. The body of lamp is a Urn or vase shape with handles on center piece. There is a dimpled design in center on front only that's a floral almost looks like lace and is very pretty. The lamp is in working order, socket and cord look original to lamp and it takes a 3-way bulb. Ornate Leaf Feet. Prism pieces are Plastic but All are present. 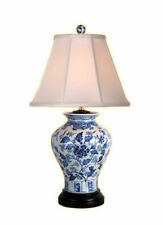 Lamp works as it should However the original wiring has multiple worn spots and I would suggest replacing. Wiring has Original BAKELITE PLUG. An excellent example of this very scarce catalog. LAMP HAS A WHITE GLASS GLOBE AND ANTIQUE FINISH BRASS. GLOBE IS 7" ROUND. BULB NOT INCLUDED. We Reclaim these treasures to bring to you to be Repurposed and we hope that you Rejoice when your Pardoned Treasure arrives! This is a gorgeous base for any of your prized shades. This is unsigned as far as I can see. Beautiful finish on this lamp in verdigris green. Very heavy and rises as well as swivels. Needs rewiring shades and a socket as shown. I like to think of them as "Jack & Jill", since they are drawing water from a well. They are a great size and have wonderful detail, gorgeous color and abundant applied gold highlights. I also love the bucket handles and chains--such a nice little "extra". 21" tall, 33" to harp, 7" across the center. Does not include shade. People are asking hundreds for similar pieces on 1stD. Just wait for your invoice. Therefore we have to offset this with handling to avoid loosing money. (TENSION SPRING FULLY WORKS. 3 LIGHT / LAMP DETAILS. SMALLEST HEIGHT - 90" High (7.5ft High). TALLEST HEIGHT - 102" High 8.5ft High). KEY LIGHT SWITCHES. 1, 2 or 3 LIGHT SELECTIONS. All that is needed for this set is dresses / skirts made for the base & lamp shades. These are very hard to find & likely never to see another pair exactly like these. 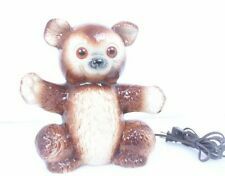 Very collectible & unique! All have been tested & work great! Each lamp is 12" tall to the top of the socket and 3½" square at the base. Require clip-on type shades. Original wiring in good condition. No noticeable flaws. Tide Redux. It is white and clear mottled Murano glass circa 1970 Italy and attributed to Carlo Nason for Mazzega. Works by Carlo Nason are in the collections of The Museum of Modern Art, New York and The Corning Museum of Glass. The columns are made from what I believe is wood that has been lacquered or other, very similar to a pool cue. All of the columns are a shiny black color with yellow swirled haze throughout, similar to marble I suppose. It will adjust and stay in place between 94" and 100". The trim is brass and accents probably walnut. Features one on/ two on 3-way switches. Therefore we have to offset this with handling to avoid loosing money. THESE FANTASTIC PIECES ARE BURSTING WITH HIGH QUALITY THAT JUST ISN'T SEEN ANYMORE! WE ARE NOT SURE OF JUST WHERE IT WAS CRAFTED, BUT WE BELIEVE THAT THIS SET IS POSSIBLY FRENCH IN ORIGIN. 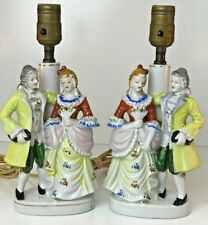 THE ORIGINAL PORCELAIN BULBS SOCKETS ARE IN EXCELLENT CONDITION (MANUFACTURED BY ARROW CO., 15 WATS AND 125 VOLTS RATED). Textured Brutalist Earthenware Table Lamp. Brass shade harp and finial. Brass, Earthenware. Oversized Studio Mid Century Modern. PLACE OF ORIGIN. MATERIALS AND TECHNIQUES. SPEAD APART ON TABLES THIS WOULD NOT BE NOTICED. BOTH WORK FINE, HAS THE SWITCHES ON THE BASE AS SEEN. EACH IS 27 1/2" TALL TO THE SOCKETS AND ARE 6" ACROSS THE BASES. A Very Desirable RAINAUD ART NOUVEAU 8 PANEL SLAG GLASS LAMP SIGNED. ~ 18" Dia (shade). The Lamp is in good condition. All conditions are listed as best as possible. I am reasonable and am willing to help. Easy project and wiring should be gone over. ORIGINALLY DESIGNED FOR USE AS SIDE LIGHTS, OR OVER DOORWAYS. THERE ARE A FEW VERY MINOR SCRATCHES TO THE GLOBES. COPYING WITHOUT MY PERMISSION IS PROHIBITED. THESE ARE EXTINCT, WHEN THEY ARE GONE, THEY ARE GONE. 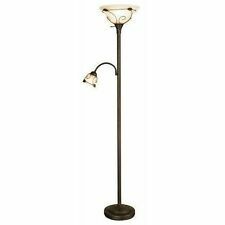 Spotlight Floor Lamp. Unique tripod design. Industrial inspired. Bathroom Essentials. Health & Beauty. Office Essentials. Appliances & Whitegoods. 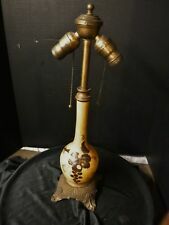 KG Electronic Pty Ltd.
BEAUTIFUL VINTAGE MID 20TH CENTURY SOLID BRASS ORIENTAL ASIAN TABLE LAMP 28-1/4"
LAMP HAS A BRASS SCROLL / FILIGREE DESIGN. BULBS NOT INCLUDED. BRASS TABLE LAMP! We are easy to work with, but will be firm and fair. We Reclaim these treasures to bring to you to be Repurposed and we hope that you Rejoice when your Pardoned Treasure arrives! THIS RARE ANTIQUE HOLLYWOOD REGENCY BRASS DESK LAMP HAS A FRFOSTED GLASS CLAM SHELL SHAPED SHADE AND ADJUSTABLE HEIGHT. SIMPLY LOOSEN THE SCREW AND YOU CAN RAISE OR LOWER THE LAMP ARM! BULB IS NOT INCLUDED. I have shown the front and the back. Richardson Reflector Light Vintage Art Display Picture or Music Lamp REDUCED! No scratches or wear of any kind to the shade or the reflector. Gold tone mid-century lamp for illuminating art work. Could be used as a music lamp also, or for other applications. Includes Lamp and bracket, wire, optional switch, extra plug, envelope with screws(?). Featuring White SATIN Cased Glass Bases with Orange Stripes. You can Light just the Top or just the Bottom or Both. Taller Lamp is approx. 22" Tall to Top of the socket x 7" Wide. Shorter Lamp is approx. Shade ~ 5" Dia ; 20" Dia. Lamp to Base of the bulb ~ 19". All conditions are listed as best as possible. This is a chance to add this unique item to your collection. SOLD AS IS. depending on your monitor settings. Gorgeous jeweled candle lamp marked depose. Original glass shade. Most likely attached to the wall. All gems accounted for. Fine addition to any collection. Stress line on stem. Sold as found. Approximatley 17" high. We Reclaim these treasures to bring to you to be Repurposed and we hope that you Rejoice when your Pardoned Treasure arrives! 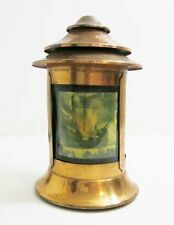 THIS IS A BRASS ANTIQUE LAMP FROM THE EARLY 1900'S. THE LAMP HAS AN "OIL LAMP" DESIGN AND WHITE PORCELAIN COLUMN AND BRASS BASE. THIS IS NICE BRASS "LILLY" STYLE LAMP. THE LAMP USES A TYPICAL NIGHT LIGHT BULB. THE LAMP HAS AN IN-LINE ROTARY SWITCH. We Reclaim these treasures to bring to you to be Repurposed and we hope that you Rejoice when your Pardoned Treasure arrives! Up for your consideration is this fine Handel closed top pine needle desk lamp. Both shade and base are in great shape and marked as shown in the photos. Hello, you are viewing my sale for a Superb Asian Chinese Japanese Vase Table Lamp With Painted Colorful Flowers Throughout. 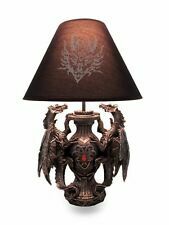 This is Lamp #2. This Asian Style lamp is in perfect working condition. There is minimal wear present. BEAUTIFUL "ALSY" BRASS DOUBLE ARM / BULB FRENCH HORN STYLE LAMP. SHADE OR BULBS ARE NOT INCLUDED. We Reclaim these treasures to bring to you to be Repurposed and we hope that you Rejoice when your Pardoned Treasure arrives!